Dr. Steven Han is the clinic director of Woodbridge Spine & Sport Rehabilitation. 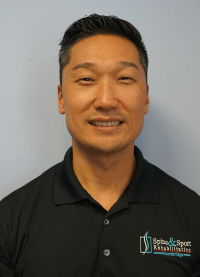 Dr. Han has been practicing in the Washington, DC metropolitan area since 2001 and is the first board certified chiropractic sports physician in Woodbridge. He has successfully treated a wide variety of acute and chronic physical conditions including sports medicine and injuries, repetitive stress disorders, work injuries and auto accidents. Dr. Han is Board Certified by the National Board of Chiropractic Examiners in chiropractic and physiotherapy and the American Chiropractic Board of Sports Physicians and licensed by the Virginia Board of Medicine. He specializes in sports injuries and has treated many high school athletes, college athletes and professional athletes. Dr. Han has been a treating physician in both The Nation’s Triathlon and DC Triathlon. He is currently the official chiropractor of the Potomac Nationals and the Dominion Cycling and Triathlon Club. Furthermore, Dr. Han is passionate about promoting wellness and preventative care. He regularly treats pregnant mothers and those who suffer from daily postural work strains (ergonomic work strain). Although very common, these conditions are treatable and preventable. He has also treated patients with chronic issues where medication and surgery has not been effective. Dr. Han received his Doctorate in Chiropractic from the National University of Health Sciences in Lombard, IL and his Bachelors of Science degree from the University of Illinois at Champaign-Urbana. Dr. Han continues to attend seminars and conferences to stay current on the latest research and development in chiropractic and rehabilitation treatments.